What is structural recycled plastic lumber? HDPE plastic lumber by Bedford Technology is a strong and durable building material that can be customized for a wide variety of commercial applications. Our HDPE plastic lumber is manufactured using High-Density Polyethylene (HDPE), primarily sourced from post-consumer products like milk jugs and laundry detergent bottles. HDPE plastic lumber is a practical and environmentally-friendly material for commercial and industrial use. Plastic lumber is an incredibly strong and durable building material made out of plastic, which is a moldable substance composed of synthetic (human-made) materials made from polymers. While there are a few different types of plastic lumber, one of the most common is High-Density Polyethylene (HDPE), which is the material used by Bedford Technology because of its durability and strength. As one of the leading recycled plastic lumber manufacturers in the United States and Canada, our durable and environmentally-friendly products have been used across a variety of industries. HDPE plastic lumber is used for hundreds of applications in the construction industry including boardwalks, retaining walls, marine industry applications and many more. While HDPE can replace traditional wood for almost any construction project, some of the most common applications using recycled plastic wood products are plastic posts and fencing, bridge pier protection systems and fender systems, retaining walls, cribbing and outdoor furniture. How is Plastic Lumber Manufactured? Recycled plastic lumber by Bedford Technology is manufactured in the United States. We use three different processes to manufacture our products: HardTool, Continuous Extrusion and Multi-X Technology. While these processes each yield different characteristics, all finished products come in standard and custom profiles sizes and will not rot, splinter, corrode or decay. Additional materials like UV stabilizers, colorant and strengtheners (like fiberglass strand) are added during each process so the end-product contains consistent color and texture throughout the entire length of the plastic lumber. No matter the application, we offer an unbeatable selection of recycled plastic wood products to choose from. If you’re looking for where to buy recycled plastic lumber, look no further – we have the products for you. How Does Plastic Lumber Compare to Wood? Traditional wooden timbers are a common building material that is utilized for many types of construction projects. This category can be broken down into two main types of wooden lumber: Old Growth and New Growth. Old growth wood is produced by natural forests developed over time, includes trees over 120 years old that haven’t been disturbed by events like fires, wind storms and logging. New growth wood is a much faster way to harvest wood for construction projects and is produced from tree farms and forests with the sole purpose of harvesting the timbers. Old growth wood is stronger and denser than new growth wood, while new growth wood is more readily available and a more cost-effective option than old growth. However, wood regardless of old or new growth, can mold, rot and is susceptible to insects and boring animals. A composite is a material that is engineered from two or more substances that have different physical or chemical properties. The composite yields the characteristics from the combined materials to create a high-performing building material. Wood composite building materials utilize sawdust or wood fibers as reinforcement. While these materials can be found at your local home improvement mega store, it can break down and deteriorate over time due to exposure to moisture and UV light. 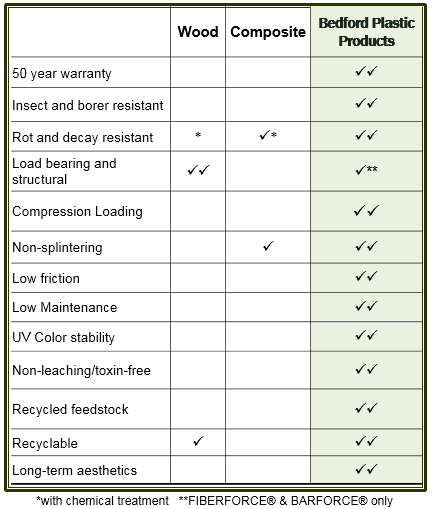 Plastic lumber is your best option for a long-term, durable, and structural building material. Ready to Go to the Next Level with Recycled Plastic Lumber? Whether you’re designing, building or planning for a project, contact us today to learn about our plastic lumber and how structural recycled plastic lumber can be the right solution for your building project. We are happy to answer any of your questions regarding our products and what sets us apart from other recycled plastic lumber manufacturers.